Stimulating questions ranging from London landmarks to Guitar Hero III. 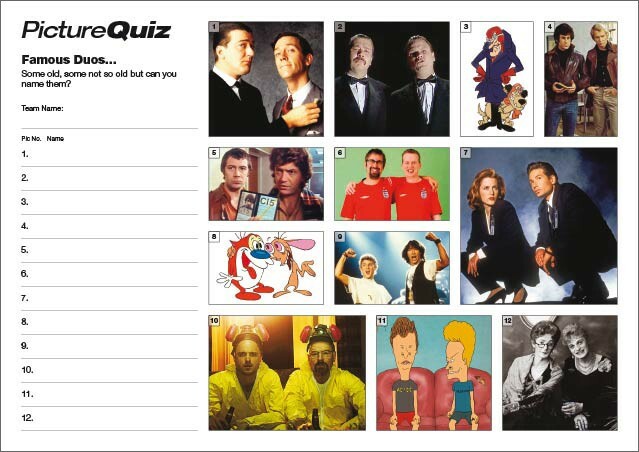 The Picture Round is Famous Duos and the Wild Card is about The Darling Buds of May. Q08. The Victorian Architect Charles Barry designed which famous London landmark? Q16. Which 2007 Kaiser Chiefs No 1 was on the main setlist of the Guitar Hero III: Legends of Rock video game? Q23. What was created especially for the Wimbledon Tennis Tournament in 1939 and is still being ‘served’ today? Q35. What’s the connection between the 1986 film Aliens, the 1994 film True Lies and the 2009 film Avatar? The Wild Card for Quiz 017 is on the 90s drama that launched Catherine Zeta-Jones into the spotlight, The Darling Buds of May.